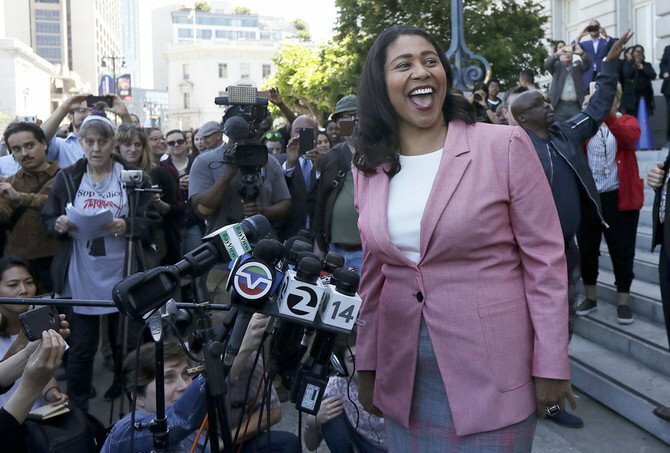 SAN FRANCISCO, US: San Francisco Supervisor London Breed emerged victorious a week after Election Day to become the city’s first African-American woman elected mayor, narrowly defeating a rival who was seeking to become the first openly gay man in the position. The elections office continues to tally roughly 7,000 ballots, but there is no way Leno can make up the difference. On Wednesday, Breed was leading Leno by fewer than 2,200 votes of nearly 250,000 counted and had 50.49 per cent of the vote. In a brief appearance before reporters and cheering supporters on the steps of City Hall on Wednesday, an exuberant Breed said she was humbled, honoured and looking forward to serving as mayor. In particular, she relished the message her election sends to San Francisco’s youth, especially kids like herself who grew up poor.